The Ram 1500 has all the latest tech in a supersized package. Not everyone needs (or can be entrusted with) technology as advanced as Tesla’s semi-autonomous autopilot in their vehicle. On the other hand, there are some connectivity and safety tech features that should not be overlooked in 2019. If you’ve chosen to purchase a new car this year, bring this list along to make sure that the car you’re buying has most, if not all, of these features. Even if you’ve gone for years without them, you’ll see just what you were missing as soon as you try them out. Is your vehicle's technology as smart as your phone? Nowadays, many automakers are creating infotainment technology that mimics a smartphone. This allows drivers to stay connected on the road without having to scroll through endless menu settings. No matter how user-friendly your vehicle's infotainment system is, sometimes you want to have your own phone's screen up on your car display screen. 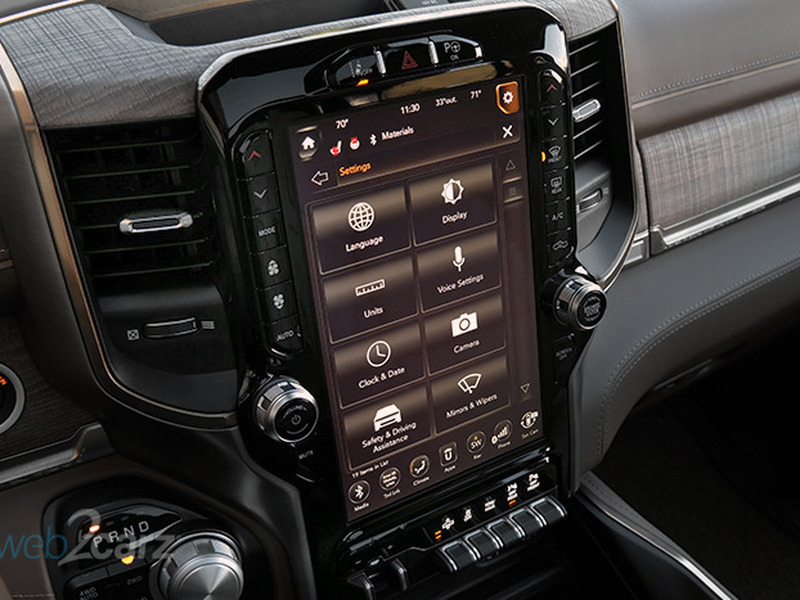 That's where connectivity systems like Android Auto and Apple CarPlay come in. Most manufacturers offer one or both of these systems to keep drivers connected without having to look down at their phones which is both inconvenient and dangerous. By plugging in your phone, you'll get a simplified version of apps like navigation, music and voice controls on your car's display. Before you get your heart set on a vehicle, make sure it is compatible with your smartphone of choice and that you buy a trim that supports it. Nothing beats having seamless, on-the-go access to everything you already know and love from your phone. While Android Auto and Apple CarPlay let you access your phone through your car's display screen, connected mobile apps inversely let you access your car directly through your smartphone. Mobile apps give you the power to lock and unlock the vehicle, check safety measure like your tire pressure and even remote start your vehicle. Most car manufacturers now offer mobile apps but they aren't all alike. Check to see which is right for you before you commit. Some teenage drivers are cautious and responsible behind the wheel, others are far from it. Not everyone will have a need for this one, but if you have new drivers in the household, teen driver tech lets you stay connected to your vehicle even when you're not the one driving. This technology can track and report speeding, turn off the music if the driver or passengers aren't wearing seatbelts and even present you with an overall report card. Once you get one, you'll wonder how you survived without a 360-degree camera. Staying connected to your smartphone may seem like a life or death situation in this day and age, but there are some car safety features that can quite literally save your life. If you can only prioritize a few features from this list, safety tech like surround view cameras, lane departure warning, and auto braking should be high on your list. Rear-view cameras can now be found in nearly every new vehicle following a proposal by the National Highway Traffic Safety Administration. 360-degree cameras are less widespread but growing in popularity. 360-degree car cameras give you a panoramic view around the vehicle offering more visibility to avoid collisions. They also make parking in tight spots and or other delicate maneuvers less of a hassle. Lane departure warning is becoming a standard safety feature in more and more vehicles every year. It allows your car to notify you when you stray from your lane thanks to cameras that monitor your position on the road. When you depart from the marked lane, your car will flash a visual cue, make a sound or vibrate your steering wheel to give you a heads up. This feature is priceless in the age of endless distractions. If you want extra confidence to make sure you don't ignore the alert, get a vehicle with lane keeping assist which will steer you back into your lane. Consumer Reports lets you sort by the manufacturer to see which vehicles offer lane departure warning and lane keeping assist. Just like the rear-view camera, auto emergency braking will become a requirement for new vehicles in a few years. However, we would not wait that long to get this feature. You'll be liable if you rear-end another car more times than not, so why not have all the possible precautions? Emergency braking doesn't mean you can spend less time looking at the road in front of you, but it will make an obnoxiously loud noise in emergency situations notifying you of the danger and allowing you to use the full capacity of your brakes. According to Consumer Reports, Infinity, Subaru and Tesla owners were happiest with their automatic emergency braking systems.